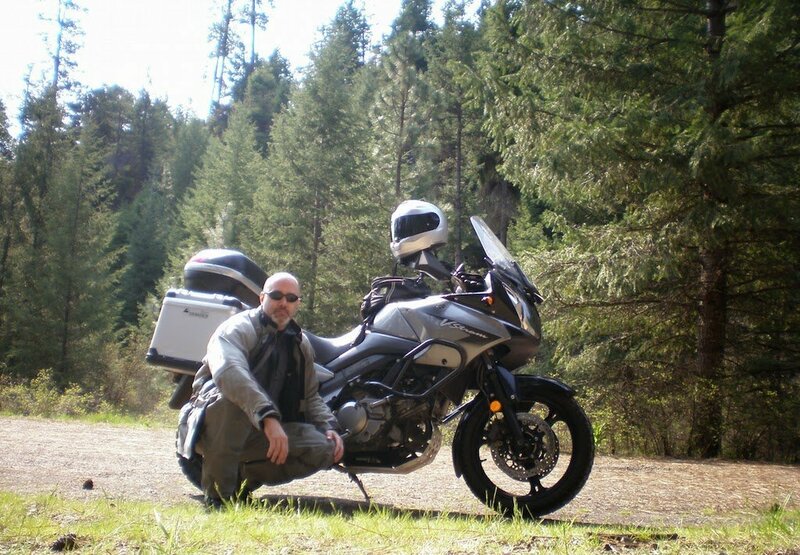 I am running out of places in Oregon that I haven’t visited by motorcycle. One of the locations on my to-ride list was Post, Oregon, the geographic center of the state. Been there, done that, won’t bother doing it again. Don’t get me wrong, the ride there and away was fine, with some classic eastern Oregon scenery and roads. 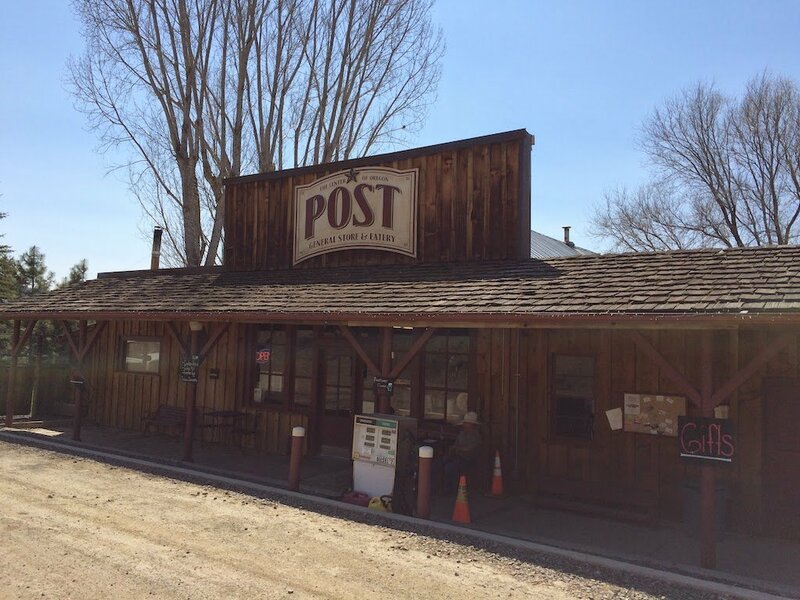 But, the location — you can’t call it a town — of Post itself is just a general store with a sign, and that’s it. They do have a gas pump, which I suppose would be convenient if you were running low. Regular unleaded cost $2.96 a gallon, which is amazingly low considering the remote location. I paused long enough to get off the bike a take a picture, then moved on. My route was Gresham to Prineville via highway 26. I know, boring. But I didn’t really have any other viable routes to take. Once in Prineville I took state route 380 east-south-east to Post, then kept going east to Paulina. When I left home, I stopped at a gas station in Boring to put some air in my tires and got chatted up by a retired school man named Val. He was very familiar with the area and suggested I take a side route south to Burns, then north on US 395. I thanked him for the suggestion and looked for the required road when I got to Suplee. Alas, I never found it. Even my GPS kept wanting me to go all the way to 395 first, then south to Burns, which would involve riding the same 45 miles of road twice in the same day. That’s not going to happen. The last dozen miles of 380 before you get to 395 are much more wooded and typical of the Blue Mountains kind of terrain. I came out onto 395 just north of Seneca. I rode up to Canyon City, gassed up, then got to my motel in John Day in the mid afternoon. I stopped at the Shelton Wayside along highway 19 just south of Fossil for a break, and used the timer on my camera to take a rare self-portrait. Dinner was at The Outpost next door. That night, some rowdy kids decided to paw-tay the night away in the room next door so it took ear plugs to give me a few hours of sleep. The next morning I left with temps in the mid 30s. I took my usual route home: Kimberly, Spray (where I got gas), Fossil, Antelope, Maupin, Wamic, Government Camp, home. The weather was perfect. I saw two cow elk cross Bakeoven Road between Shaniko and Maupin, and earlier saw a wild turkey on the pavement, but other than that the only other critters I saw were a half dozen dead deer at various places along the route.